Bandura's theory on social learning can be traced to Hull's neobehaviorism because he learned from theories of Hull in graduate school. The term social learning theory was first used by theorists that were following Hull's ideas. These theorists connected Hull's concepts of human social behaviors to imitation. Bandura was very interested in learning more about imitation, that he became another researcher on the topic. Bandura's thoughts on imitation included that we have expectations for ourselves and that strongly influences out behaviors. He also believed that cognitive variables and observational learning helps us grow and learn as individuals. Bandura was more interested on studying children and aggressive behaviors and that is why he did the study of the Bobo dolls. The results of that study showed that children are more aggressive when they saw their parents having aggressive behaviors towards the doll. Children learn through imitation from their parents and other people they may look up to. This theory is still important and used today on children. References: Powell, R. A., Symbaluk, D.G., & Honey, L, P. (2002) Introduction to Learning and Behavior (Fourth Edition ed.). Belmont: Wadsworth/Thompson Learning. I think we learn from behavior especially at younger ages. This can also be seen in the Stanford Prison Study, at first the guards followed the rules of the experiment, but when they saw that one broke the rules and got away with it they started acting the way of that guard. People are more likely to imitate a behavior when there is no punishment afterwards. Imitation can also be used to try and get rid of bad behavior in children. I like how you explained the Bobo Doll Study and how aggression and imitation connect. 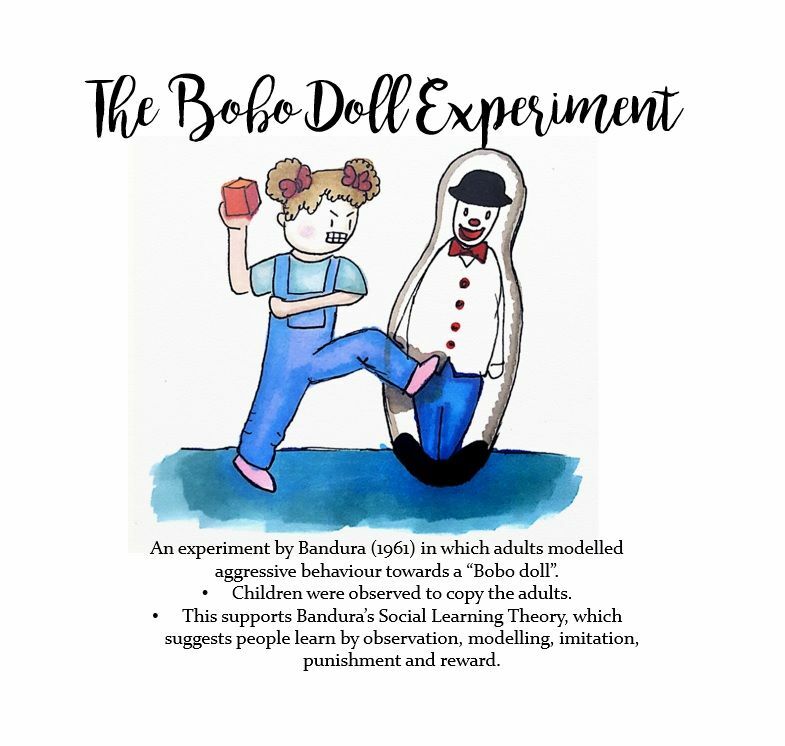 Bandura's bobo doll experiment is also really interesting to look at when talking about children that have grown up with domestic violence at home. Kids that witness their parents being violent or aggressive towards each other without repercussions will grow up thinking that violence is acceptable behavior. This causes problems for children in school with their peers and teachers and later their romantic partners.